It is much rain in June at the Four Girls Mountains, but the flowers are in their full glory most. Then, a lot of pretty flowers bloom and many field of alpine flowers appear to here and there. The photograph (under) is a field of alpine flowers at the Muluozi Terrace 3700m in the Long Terrace Valley, and like this carpet of flowers appears at many places in the first half of June. Also, at the Renshenguoping 3300m in Twin Bridge Valley where is next to the west from Long Terrace Valley, a big colony of the Primula with strong pink appears in the middle of June. 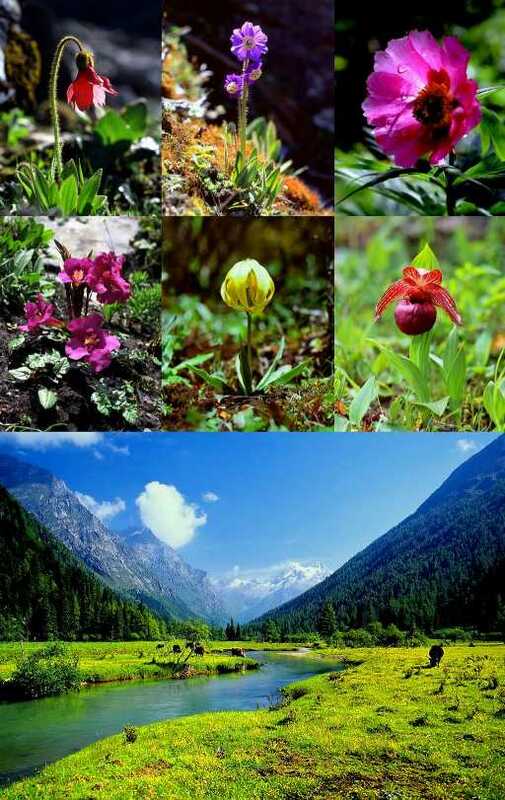 At around 4000m high, Fritillaria przewalskii Maxim exBatal and Lilium lophophorum what is a kind of lily, Cypripedium tibeticum what is big red and Incarvillea Compacta Maxim what is like a big flower of the pulse family are conspicuous. These are bloom in June most. Also, a colony of the Paeonia veitchii Lynch what is a kind of a peony becomes seen here and there around the village as much as 3200m high. Around the Balangshan Pass, many colonies of Meconopsis punicea Maxim (red poppy) appear following the Meconopsis integrifolia (yellow poppy) what began to bloom in May. Then, Meconopsis simplicifolia what is a kind of the blue poppy begins to bloom, too. There are several kinds of blue poppies what bloom in Four Girls Mountains, and various kind of these flowers bloom from June to August at around 4000 - 4700m high. There are also many Rhododendron at Four Girls Mountains. It began to bloom at along mountain ridge near the village in May, and begins to bloom at deep valley in June. It shines out with fresh green leaves of larch and the remaining snow.